I recently discovered a Korean tofu factory that sells fresh tofu from the factory door. It’s a little hole in the wall place next to the Korean corp of the Salvation Army in Belmore. They do a roaring trade selling basic white tofu, silken dessert tofu with ginger sauce and fried tofu pockets in various shapes. That’s the entire range. The tofu is often still warm when you buy it and it keeps beautifully in the fridge, stored in an airtight container and submerged in water. What a revelation super fresh tofu is, it makes it hard to go back to the vacuum packed stuff from the supermarket. Korean food has many similarities to Japanese cuisine, but it is much simpler and heartier with more robust flavors. 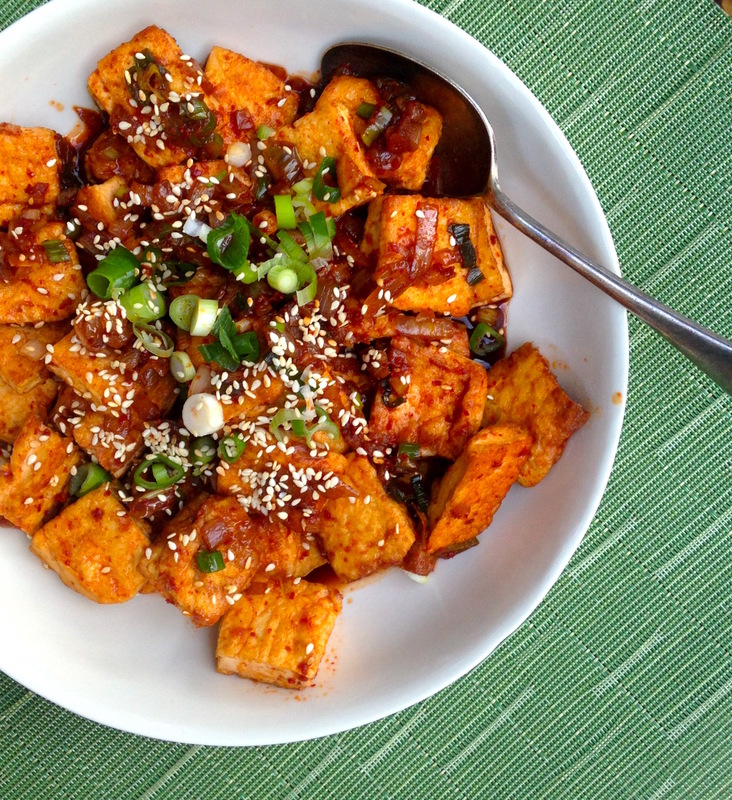 Like most Korean food this braised tofu is a simple and easy dish to bring together. It does, however, use a special ingredient, gochugaru or Korean pepper flakes, which gives it a distinctive red colour and a smoky, hot, slightly sweet spiciness. The first time I made this dish I substituted Chinese chilli crisp in lieu of gochugaru and while perfectly tasty it really wasn’t the same. I became a bit obsessed with tracking down gochugaru and making a more authentically Korean dish. I live in an area of Sydney with a large Chinese population and with loads of Asian markets but none of my regular shops stocked gochugaru. Finally I googled Korean – food – Sydney and discovered a Korean market located in an obscure side street off my main shopping strip. I’d walked past this market many times but had never gone in, mainly because its windows are stacked with economy-sized boxes of washing powder and other household items and it looked like a cheap discount store. Inside it’s a different story – a little Korea with Asian pop music blasting, fridges of kimchi and shelves stacked with soy bean paste, soy sauce, sesame oil, dried kelp, mung bean noodles and of course the magical gochugaru. There’s something very satisfying about tracking down an obscure ingredient and making it familiar. I studied up before hitting the shops just to make sure I was buying the right red pepper flakes. This post from Maangchi a Korean food blog is a good explainer on the different types of gochugaru. I love braised tofu in its many forms because it always makes a great wok and rice pot meal. This spicy tofu keeps for about 3-4 days in the fridge and makes a great leftovers. What more can you ask for – simple, urban peasant food and dinner in a flash. Rinse tofu and pat dry with paper towels. Slice into 1cm thick bite-size pieces. Put cooked tofu on a plate and set aside. With the remaining oil fry onion and garlic for a few minutes until onion gets a little crispy, add all but a tablespoon of the green onion (keep the rest of the green onion for a garnish) Fry until green onion is soft and translucent. Add sauce and simmer, stirring until it thickens and reduces a little. Add tofu and stir through sauce until all the tofu is coated and absorbs some of the sauce. Serve with rice, garnished with green onion and toasted sesame seeds.